Celebrating Onam | Walk with us! Onam (Malayalam: ഓണം) is the biggest festival celebrated in Kerala, India. It is also the State festival of Kerala with State holidays on 4 days starting from Onam Eve (Uthradom) to the 3rd Onam Day. The festival falls during the Malayalam month of Chingam (Aug – Sep) and marks the commemoration of home-coming of the mythical King Mahabali. In Kerala, it is the festival celebrated with most number of cultural elements such as Vallam Kali, Pulikali, Pookkalam, Onathappan, Tug of War, Thumbio, Thullal, Kummati, kali ,Onathallu, Onavillu, Kazhchakkula, Onapottan, Atthachamayam etc. Onam is reminiscent of Kerala’s agrarian past, as it is considered to be a harvest festival. One of the traditions of Onam and, I think, at other important events is the floral arrangement that Brs. Libin Paulos, SCJ (2nd year), Franklin Victor, SCJ (3rd year) and Alex John, SCJ (1st year) worked on from about 11:00 pm until early morning. They were putting finishing touches on it when I walked outside my room to head to the kitchen at about 5:20 am this morning. The fourth year students actually had class this morning at 9:00 am. We are in Andhra Pradesh and the meaning and practice of Onam is limited to Indians originally from Kerala. As I noted yesterday we did not celebrate it during the time Fr. Louis Mariano Fernandes, SCJ, was rector as he was from Goa. Scrambling the eggs for an American breakfast! As far as breakfast is concerned it went over well. Not one of the brothers had ever tasted scrambled eggs. At least in our houses when you say egg it’s either hard boiled or what the call an omelet, though it is a bit different from what we’d find in the States and certainly different from those served on Eggs to Order Day at Sacred Heart at Monastery Lake. My crew showed up on time with Br. John Benedict Vinoth Kumar Antonyraj, SCJ (4th year from Tamil Nadu) was technically about three minutes late, but for him that’s like being on time. We spent the first hour getting all the preparation work out of the way, especially peeling and slicing potatoes for the fried potato dish and peeling and chopping onions for both their fried potatoes and scrambled eggs. Yes, tears were shed over the onions but they were happy tears. Our last task were to cut up the tomatoes and that job was expertly handled by Brs. Manish Nayak, SCJ (2nd year from Orissa) and Sajeet Pillai, SCJ (2nd year from Mumbai) Both John and Rekha (the our cooks) came and gave us some assistance, especially in lighting the grill, making the coffer and assisting Vinoth with frying the potatoes and onions. Br. Shabu Dennis, SCJ (3rd year from Tamil Nadu) was helping me with the scrambled eggs (we added onions and cheese for this recipe) but somewhere along the line Br. 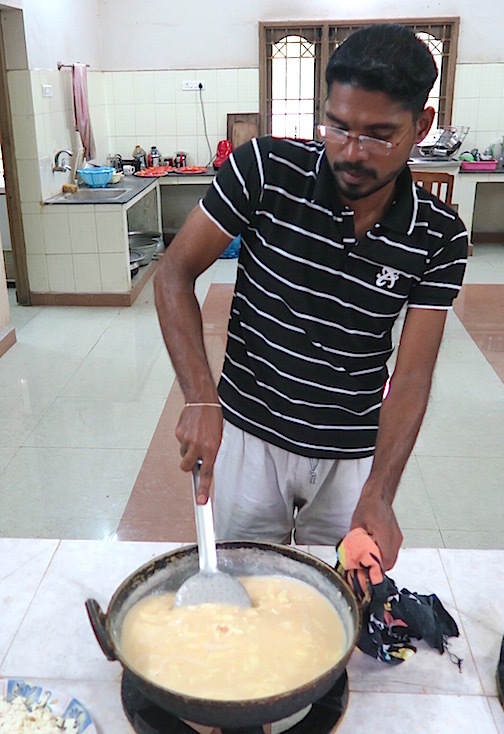 Franklin Victor, SCJ (3rd year from Kerala) stepped in and took over for Shabu, who didn’t seem to mind. With everything well in handy we managed a ten minute coffee break before starting to cook the eggs and potatoes. We were able to finish everything and have the meal out and ready before the brothers came from either chapel or in case of our basketball team from practice. If I were to jude the quality of the meal only the fried potatoes were a disappointment to me (not to the brothers since it was new to them) they could have been cooked a bit longer. I think we had too many people at the grill turning them too often. The flavor was just fine but I’d call them a bit undercooked. The eggs on the other hand came out perfectly. I told Shabu, that once we had cracked the eggs his job was to beat the bejesus out of them to get as much air into them as we can. Shabu performed his task admirably!